I started our Movie Blog section way back in 2014, entirely to find a home for my nostalgic rumination of the effects of Saturday tea time telly on my subsequent love of the silver screen. Here we are, four years later and I’m astonished that this website still exists, I’m also aware that to date, that one entry is the only one in that optimistic section. To the point in fact that our most recent facelift completely removed the Blog from the menu. Ah well, maybe we’ll resurrect it. Maybe I’ll add it back entirely to cover this latest slice of misty eyed rambling. And so, on 6th September 2018, we said so long to another of my childhood influences. The Bandit cackled one last time and sped off into the ether, ironically ten years after his buddy Cledus and fully thirty one years after his nemesis Buford T. Justice. The only time the Bandit has ever been third in that race. Burt Reynolds but the peddle to the metal for the final time at 82, a speed the Bandit would never have been seen dead maintaining. Hell, Cledus was specifically set at more than ninety in their immortal run from Atlanta, Georgia to Texarkana and back. Outliving his two costars by almost exactly 11 years (Both Jerry Reed and Jackie Gleeson died at 71), in truth the Bandit had been quiet for many years. 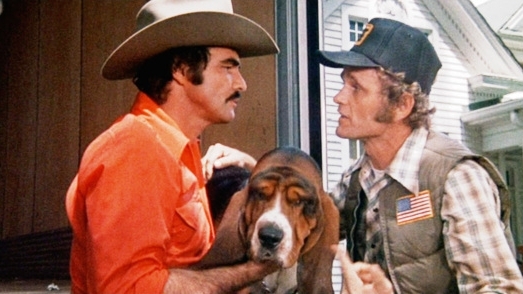 I’m not entirely sure when Smokey and the Bandit (1977) first wheelspan into my consciousness. I’m not old enough to have seen it at the cinema and I highly doubt my parents brought it home from whatever our local equivalent of Blockbuster was. Actually, now that I think about it, I know exactly what the local equivalent of Blockbuster was. It was a tiny video rental shop on ‘The Estate’. To beg your indulgence for a moment, my hometown had fairly straight lines of division. I don’t mean ethnic or cultural division, my hometown had neither of those subtleties. My hometown had a fairly traditional profile whereby the closer to ‘Town’ you lived, the less well off you were. From ‘Town’ outwards you went past the working mens’ clubs (frequented in the glory days of our town by miners, frequented by ex-miners once Thatcher had taken over) on to the aforementioned Estate (ie. the council houses as they were known then, ‘local authority housing’ now), past the schools, through the not quite middle class estates (ie where I lived) and then on to the larger houses that occupied their own drives off into the forest that surrounded our town. I digress from my digression. The video shop sat next to the off-licence my mum worked in once she faced up to the fact that my dad’s employment was always gong to be a roller coaster ride of sales and redundancy and that the world wasn’t quite up to acknowledging that anyone who had the audacity to stay home to bring up their kids might want to go back to a job similar to the one they left pre-maternity. I always remember the smell of that shop. You can still get it now if you find an old VHS lying around but somehow it’s never quite the same in isolation as it was on three walls and four aisles on The Estate. We would get to visit the shop only rarely, usually on some kind of school holiday afternoon but I always remember being impressed that my mum knew the guy who ran it. I don’t think Smokey and the Bandit ever came from this shop but I can’t be sure. I can’t even be sure which of the three movies I watched first but for the sake of my almost certainly fictional authenticity, I’m going to claim that I first saw the first movie on the telly. Inevitably it was ITV (again, if you read the first blog you’ll remember Central in my part of the world) and inevitably it was the cut TV version. Which means we got a hold load of ‘shoots’, though I suspect the one mouthed actual profanity was left in. It didn’t matter which version, the Bandit’s total lack of respect for the law was a childhood joy. Which, on watching after years of Grand Theft Auto, feels a little bit weird. To level with you completely, I never really watched Smokey and The Bandit for either of the headline acts. It was weird reading of Burt Reynolds’ death and instantly feeling an itch in the back of my mind. When I looked up this movie, I realised what that was. Ten years ago almost to the day I was mourning the passing of Jerry Reed, the man who did the actual work whilst the Bandit showed off around him. I’m not sure what it says of my lifelong self confidence that I always identified with the supporting act in one of my favourite childhood movies but there you have it. When I watched the movie and played it out in my mind, I was always in the truck, with the dog, whilst the witty, good looking guy in the sports car was running interference for me. So, ten years ago I was moping around, commiserating with almost nobody over the death of The Snowman. But it was never The Snowman that carried the series, it was always the Bandit. I was way too young to appreciate Reynolds’ actual acting talents (Deliverance is a movie I shamefully have still not seen), but the idea of outdoing the obsessive attentions of Sheriff Buford T Justice chimed with my young aspirations to be somewhere, anywhere else. Of course, the beautiful existential irony of the double or nothing ending didn’t register with me at that point but you can only expect so much of an eight year old. The Bandit led a weird and short-lived trend in movies all of which somehow landed in my early 1980’s world. The inevitably sequel, complete with Dom DeLuis hilarious Doc antics - bizarrely (though nobody questioned it at the time, it was the eighties after all) involving transport of an elephant across states, followed on from Convoy and arrived in the same year as The Cannonball Run (also followed by a sequel). And of course, the inevitable one where Burt was too famous to turn up so the series fully jumped the shark and had the Smokey as the Bandit. Which makes no kind of any sense. I’ve got somewhat mixed memories of that lot, though I seem to recall very much enjoying Convoy. On review it’s memorable for two things. One being a cast clearly way better than the material (Ali MacGraw, Kris Kirstofferson and Enest Borgnine), and the other being that it’s based on a song. Oh, and it’s directed by Sam Peckinpah. Maybe I’ve misjudged this one, maybe it’s a stonewall masterpiece that just happened to come out after Smokey. Memory is a funny thing. A ten year old sat watching a Pekinpah chase movie, having a whale of time mainly because the lead character was called rubber duck. I can’t remember how it ends but I’m guessing it wasn’t well. Speaking of not ending well, I remember watching Vanishing Point on TV with my parents too. Well, that’s not strictly true, I remember the ending of that movie (spoilers, though lord knows if you’ve read this far and haven’t seen it, you don’t deserve the warning). I remember the car walloping into the diggers at hight speed and I remember the glazed look in Barry Newman’s Kowalski’s eyes. And all this from parents who wouldn’t let me watch Doctor Who, I guess they had their reasons and I’m not complaining, between the Doctor and Kowalski, I know which I’d pick now and it’s the same one they picked then. And then, almost as quickly as it began (which, let’s be honest, it was only quick in my memory - Vanishing Point was ’71 and The Cannonball Run Part 2 was ’84), it was over. The chases wound down and the stars moved on. For Reynolds at least it was a high water mark of sorts. He had just the right kind of swagger, just the right warmth and just the right laugh. A laugh that still slays me even today. A laugh that blasted out from the inevitable gag reels at the end of the main feature. He returned of course, like the Bandit always did, most notably in Paul Thomas Anderson’s Boogie Nights in 1998 but somehow never quite captured that moment again. But maybe he didn’t need to, at least not in my mind. Maybe it’s better that for the most part he remains that cowboy with a twinkle in his eye, cackling whilst the dirt flew and the tyres screeched. Maybe that’s why he sticks with me and that’s why it hurts that he’s gone. Maybe it’s always the Bandit I see in my rear-view mirror and never Burt Reynolds. Well, so long then Bandit. I hope that where you’re going is eastbound and down. We’ve all got a long way to go and sadly all too short a time to get there. We’d all be so lucky to stick it to the Man as many times as you did, there isn’t one of us that doesn’t want to leave him crawling out of a partly sunk car or gesticulating wildly at his ruined bike. But most of us don’t, most of us need cowboys like the Bandit, so thank you for the showing off. And most importantly of course, for keeping Cledus and Fred safe.